You know when you get an idea in your head and just can't shake it? Like wallpapering a room? 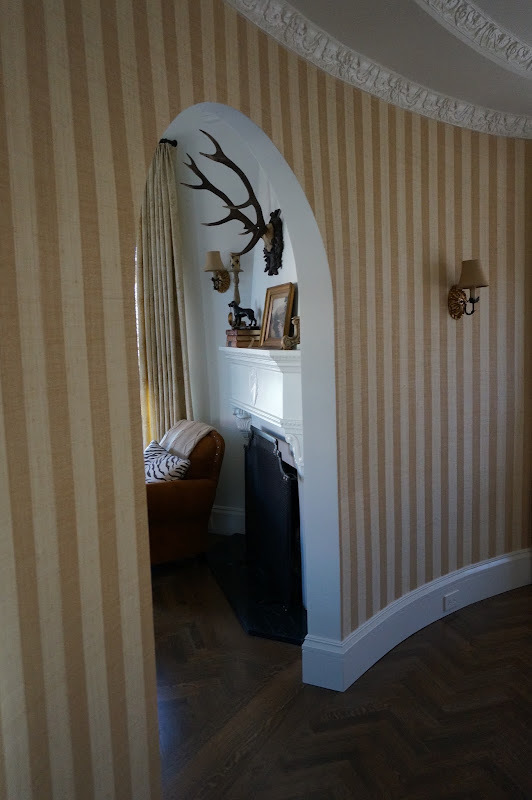 Well, I always secretly wished I could wallpaper our dining room, but felt that because of the archways, I couldn't. So I contacted my installer for advise. Can this room be papered? Will the stripe grasscloth paper I'm obsessed with work, or look weird? How will you go around the arches without moulding? He assured me it would look amazing. So I ordered the paper from Philip Jeffries, a raffia maize colored stripe. As it was being installed around the room--and I mean "around" the room because it is an oval shape, I was doing the happy dance! The arches weren't a big deal after all. My installer knows what he's doing! It's almost like it was always there! I love white walls, don't get me wrong, but the dining room has been a challenge. With oval walls, I cannot hang any art whatsoever. The most I can do is lean a mirror at the end of the room! The wallpaper makes those challenges go away. It's like it is the art. The room was finished just in time for us to host a small dinner party. The stripe inspired me to dig out my majolica pitchers for a centerpiece of white hydrangeas. You know, when we moved, I put all those plaid, floral and patterned plates in storage. But somehow they found their way back to my dining table! Stenciled burlap placemats under wicker chargers. Ralph Lauren plaid plates with my special majolica salad plates. Bone handled flatware from Restoration Hardware. This is my first "tablescape" in this house. It looks like I'm a little rusty, since I forgot the glasses! I posted a photo of the dining room on Instagram a few days ago and got a lot of comments. "You make me laugh because you really have a particular style - and you try to change it up - but you came back to it here - and it looks fabulous!!!" Stay tuned for yet another room I just had to wallpaper! I promise this is it! I was thinking the same thing that Joni said!! YOU have a definite style very Ralph Laurenesque. ♥♥♥ the stripes in fact as soon as I saw it they made me miss my green striped dining room. It looks fabulous D!! I was thinking the same thing too! THIS is your style and I love it. That looks wonderful. He did a great job and it does dress up the room nicely. Beautiful and a touch of rustic, I just love your style. The room looks fantastic! You have such great style! Life is too short to decorate the way you think you're 'supposed' to. Listen to your instincts! 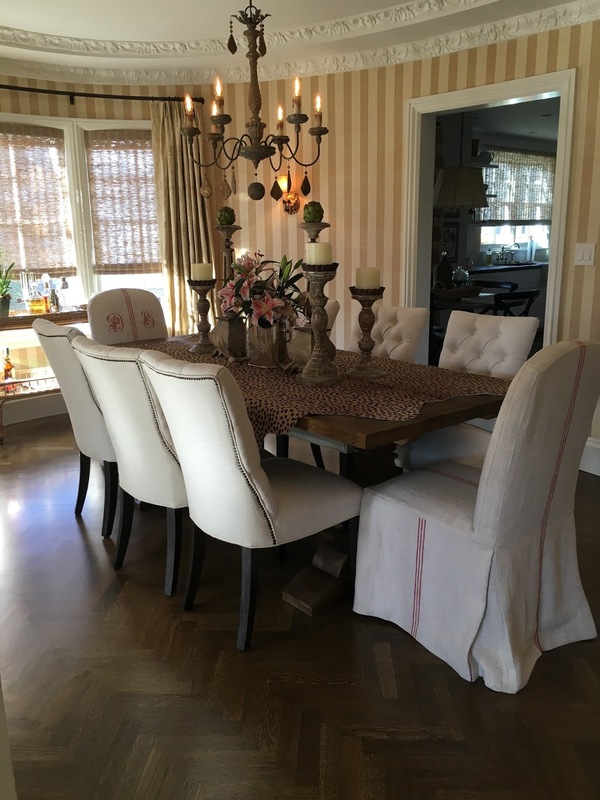 That textured stripe makes the dining room look so warm and inviting! I love the stripes! Just beautiful! Your style is fabulous...glad it is back! Besutiful I loved you Room look great!!! What wonderful wallpaper. 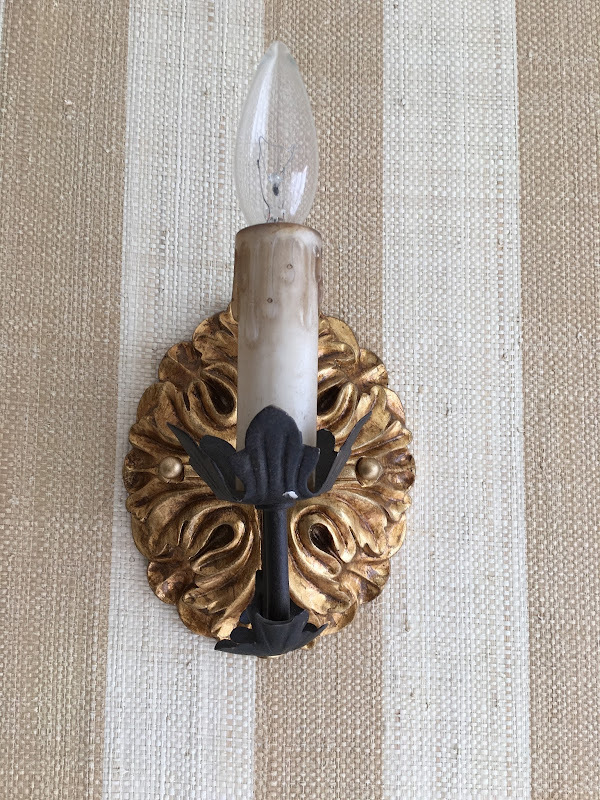 I love the texture and it looks great in your dining room. 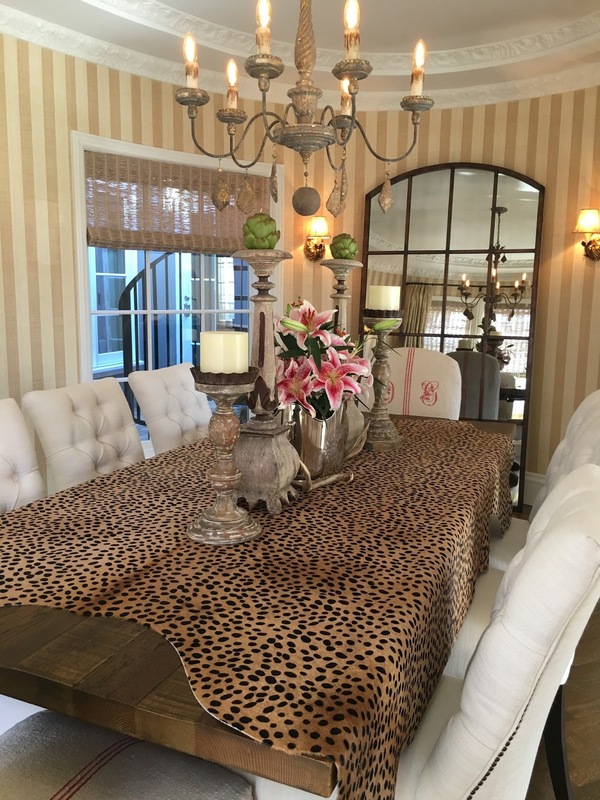 Oh my word, the wallpaper is fabulous and so is that leopard table cover. I love your dining room. Oh - I so love that wallpaper. The close up of it really shows the texture. I like the table best without the animal print - the softness of the hydrangea works well with the trim work and vibe of the room. The wall paper looks beautiful in the room. I love how your room is shaped. This room is why I started reading your blog. Love it! I have been missing your tablescapes... so glad to see you back with them!! Where did you get the leopard covering on the table? Love the texture and of course the stripes! I agree with earlier posts (Layne, Lynne and Angelina). I feel like you are back again. Tablescapes and decorating. I am so happy! The stripes warm the space and make it intimate (and I imagine they look wonderful with candlelight). Will say it again---am so happy you are still blogging. I don't usually agree with Joni, but this is the exception!! The room is beautiful, the tablescape just what I would expect from you and I think you "did good" as my grandgirls say! I saw that comment from Joni on IG and I laughed to myself - she's soo right! You have your own style and it's why everyone started following you! You have honed it and pared it down a little, but it's still there (in a good way!) I adore the wallpaper Delores - it looks so good! And I'm so glad to see you do some tablescaping again - I've missed it so!